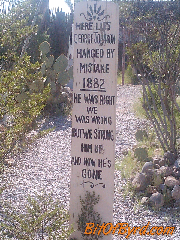 Yesterday Brittany and I drove down to Tombstone. Don't know about Tombstone? Then you should watch a few movies like I did. One being Wyatt Earp and the other is Tombstone . I suggest they be watched in that order too. The town was interesting but you can tell that the history is going to end up disappearing because no one is taking notice it seems. So if you live close and haven't been... Do it. 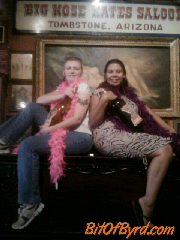 Make sure you visit Big Nose Kate's. They were the most accommodating to tourists and took several pictures with our cameras using their props. We also visited the graveyard. Disclaimer: Links are affiliate links ans by using them to make your amazon purchases you are supporting Bit Of Byrd.